It’s been 8 years since Bujold last published a Miles Vorkosigan novel – long before I started this current journal (my reviews of the earlier books are still on my old site). Cryoburn returns to the adventures of her quirky hero, after an identical gap in his own life: Now 39, Miles is happily married with children, but we see little of that, because this adventure takes place on the world Kibou-daini, a Japanese-populated planet whose inhabitants are obsessed with staving off death, and where cryo-freezing of the sick of elderly – or just people afraid of becoming sick or elderly – is common, and a dominating chunk of the economy. I felt the series was flagging before the hiatus (admittedly a big part of the reason is that I didn’t care for Miles’ wife, in much the same way I wasn’t fond of Harriet Vane in Dorothy Sayers’ Lord Peter Wimsey novels, and those last novels revolved around their courtship and wedding), but unfortunately Cryoburn is anything but a return to the series’ previous form. The book opens with Miles wandering, drugged and thirsty, through the catacombs filled with cryogenic units. His bodyguard, Armsman Roic, and several other attendees of a cryogenic conference, have been captured by a radical group protesting the widespread use of cryogenics, but Miles had an adverse reaction to the drugs (as he often does) and is released into the catacombs. He manages to stumble to safety, where he’s rescued by an 11-year-old boy named Jin, who lives in a small commune taking care of a menagerie of animals on the roof of one of the building. Roic and the other abductees, including cyrogenics expert and friend-of-Miles Dr. Raven Durona, escape from their captors, and Miles gets back in touch with the Barrayaran embassy. Then it turns out that Jin’s mother was the leader of a different protest group who disappeared 18 months earlier, under mysterious circumstances. Miles feels curious – and perhaps a bit obligated – to find out what happened to her, though this is a distraction his main mission of investigating one of the cryogenic companies and their interest in setting up a large facility on one of Barrayar’s subject planets, but it forms the core of the story. Cryoburn mainly involves chunks of sleuthing (what happened to Jin’s mother and her group, who might be connected to their disappearance) mixed with chunks of cloak-and-dagger (stealing bodies from the catacombs, tailing persons of interest, snooping around buildings). The stakes are high for Barrayar’s subject world, but Miles really makes short work of that project, focusing most of his effort on Jin’s mother, whose story presents even greater implications for the future of Kibou-daini. But on the whole the book is an unambitious story of running around, Miles showing off his stuff, and making his opponents look impotent by comparison, despite operating on a planet where he doesn’t have any actual authority. A friend of mine commented that one of the problems with the Miles books is that his Imperial Auditor’s position combined with his formidable intellect and large network of capable friends and allies means that few problems are large enough to really give him a challenge, and certainly Cryoburn doesn’t really give him one: There are a few speed bumps along the way, but I kept waiting for “the other shoe to drop”, where the people he’s after launch a significant counter-attack, but what eventually materializes is almost comically incompetent. Basically, the “bad guys” have barely any idea that Miles is even after them, so he’s able to poke into their affairs nearly unmolested, and certainly Roic and the embassy’s armsman are more than up to the task of dealing with the obstacles they do encounter. The outcome never really seems in doubt. In short, Miles just seems too capable, too powerful, for anything less than planetary-level adversaries to give him much of a challenge. And that makes for dull plotting. The long-running pattern of the Miles books is the adding of new characters, who have varying degrees of sympathy with Miles, and having him either win them over to his side, or make their lives better (often by playing inadvertent matchmaker), and there’s plenty of that here. Sometimes it gets a little tiresome and repetitive seeing these ordinary people dragged along in Miles’ overpowering wake (Roic is keenly aware that he’s a supporting character and bears the role stoically; Raven is immensely capable in his own ways, and mostly gets out of the way to let Miles do his thing), although it can still be entertaining: Seeing Miles evaluate and win over Consul Vorlynkin – a man who, after all, has been posted to a relative backwater and perhaps for good reason for all Miles knows at first – is rather clever. But still, the series seems to have sunk deeply into formula. 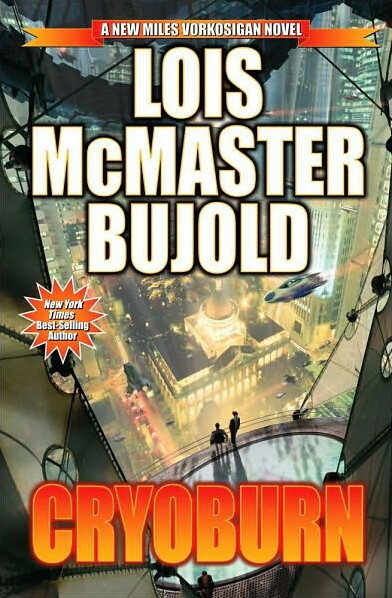 While Cryoburn is entertainingly written, with a number of quotable lines, it unfortunately doesn’t feel like 8 years’ absence has recharged Bujold’s batteries from similarly-bland few novels prior to the interregnum. My best guess is that Cryoburn the novel to refamiliarize readers with Miles after his long hiatus, before launching into a more substantial story. But man, this is a really weak way to lead into such an arc: a rather trivial story with a surprisingly weak by-the-numbers plot. I’d rather Bujold had just gone for the gusto and leaped into the next story with both feet from the outset. Because overall, this book is pretty forgettable. Spoiler Warning! After the jump I discuss the end of the novel. I’ve heard it said that the reason for the long delay between novels is that Bujold was trying to work her way up to writing the necessary events to bring Miles to the next stage of his life: His ascension to being Count Vorkosigan, which naturally implies the death of his father, Aral. And Aral’s death is indeed announced on the last page of the novel proper, with five short epilogues regarding his funeral on the three pages following. Partway through the novel I thought, “Gee, I wonder if she’s going to do something as horrible as killing off Aral summarily at the end of a novel completely unrelated to him? Because if she’s going to do it right, she ought to send Miles off to Sergyar [the planet Aral is overseeing for the Emperor] to have an adventure there.” I was dismayed to see that indeed that’s what she did. Cryoburn is not even a particularly rousing adventure for Miles, so it’s not like he managed to triumph over great personal adversity and then experience a horrible loss just when it seemed he’d come through the worst of it. This approach guaranteed that Aral’s death would have the least possible emotional impact for the reader, since by now he seems like this distant figure who dies off-panel. It really does a disservice to both Miles and Aral to handle Aral’s death in such an offhanded manner. While that might be how life works sometimes, it makes for awful storytelling. It really just serves to make a weak novel worse. I infer that the next novel will deal with Miles’ transition to his hereditary position, but it’s hard to see how the lead-in to that novel could have been handled much more clumsily than Cryoburn. ‘Fraid you’re not correct on the next Milesverse novel, unless things change. She announced at the Mountain View signing that the next one will both be focused on Ivan and take place 3 or so years prior to Cryoburn. However, the novel’s been acting like Ivan, letting other things get her attention rather than it, so it’s unclear when it’ll be finished. Hmm, well that makes the existence of Cryoburn make even less sense to me. Maybe the series has simply jumped the shark. I disagree. I think that given Miles’ career, it would have seemed very contrived for him to happen to be there when his father died.